The Datong Nine Dragon Screen, built over 600 years ago, is presently the oldest and largest glazed screen in China today. It is three times larger than that in Beihai Park , Beijing City. The screen, built for the thirteenth son of Zhu Yuanzhang, the first Emperor of the Ming Dynasty (1368-1644), has been well preserved and remains intact to this day. 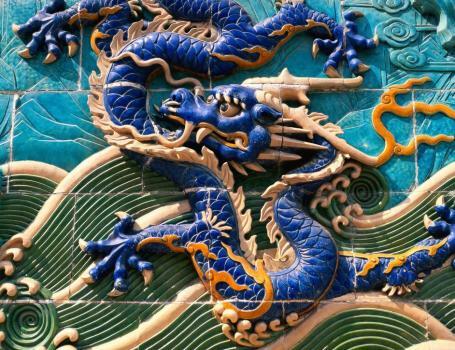 It is made up of 426 specially-fired glazed bricks, with a height of 8 meters (about 26 feet), 2.02 meters (6.6 feet) thick and 45.5 meters (149 feet) long. The Screen can be divided into three parts, the pedestal, body and roof. The pedestal is rectangular shaped with a height of 2.09 meters (6.9 feet). Its narrow middle section is composed of 75 glazed tiles with images of oxen, dogs, deer rabbits and other animals. The design of the body is that of a green wave on the lower part and a blue and yellow cloud on the upper part. It consists of nine flying dragons, with a golden-scaled, shiny-eyed dragon located in the center. On each side of the central dragon is a pair of light yellow dragons with their heads pointed East and tails pointed towards the central dragon. A second pair of elegant yellow dragons is next with their heads and tails pointed west. A third pair is ferocious-looking purple dragons which seem to be wrestling with the sea. The fourth pair is highly spirited dragons. The nine dragons are life-like and illustrating their ability of calling the wind and controlling the rainfall. The areas around the dragons are supplemented with images of plants, mountains, stones, water and grass. These patterns along with the nine dragons compliment each other.The roof is covered with glazed tiles.There is a pond with a stone bridge located in front of the screen. The reflection of the dragons becomes dynamic, especially when a breeze disturbs the surface of the water.